Headlands International Dark Sky Park has been recognized with the 2017 International Dark Sky Place of the Year Award. Like all Dark Sky Places designated by the International Dark-Sky Association, Headlands International Dark Sky Park offers visitors a protected nighttime wilderness to experience first-hand the beauty and inspiration found in the natural nightscape. But Headlands really shines in its efforts to provide programs that put visitors in touch with our heritage of human inspiration cast by the stars. 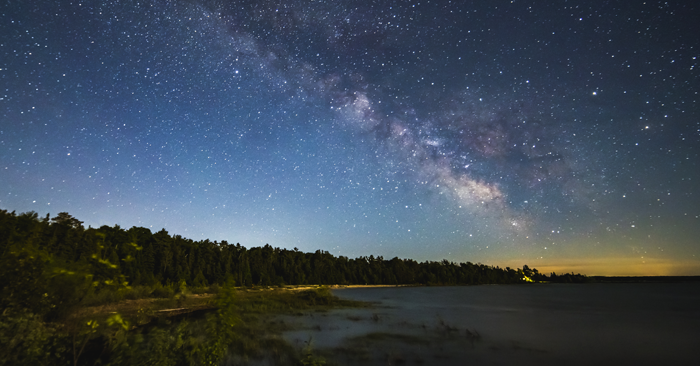 Located near the northern tip of Michigan’s lower peninsula, on the shore of Lake Michigan, Headlands International Dark Sky Park safeguards the human imagination by preserving access to both the night sky and the stories it holds. While most astronomy programs are rooted in the study of celestial objects from our current cultural and scientific perspectives, Adams thoughtfully designs programs at Headlands International Dark Sky Park to celebrate the variety of ways societies have used the night sky to express their understanding of humanity through the ages. “You can uncover the stars in anything,” says Adams. While visitors consider the many ways that the canopy above connects us to our heritage, Adams also encourages us to think deeply about our own social identity. After all, she says, “Our current understanding will be the mythology of the next generations.” How will we choose to be remembered?